The Oilers didn’t draft first overall. That’s pretty much the summary of a season that included key injuries, and the same old deficiencies, despite a new management and coaching regime. The season wasn’t a complete loss, however, because it saw the arrival of Connor McDavid, albeit the condensed version. A fluke (or not-so-fluke) injury cost McDavid a possible Calder Trophy and robbed Oiler fans of seeing their star for a full year. Unfortunately, 45 games of McDavid and his rookie-of-the-year nomination were the only highlights of the 2015-16 campaign. There were marginal improvements in the teams’ overall game, as they adapted to another new system and head coach. They had glimpses of strong play in the midst of the bad, though it didn’t translate in the standings. But that was last year, and there is probably no team more looking forward to turning the page than the Oilers. With some new faces and a slight changing of the guard, (mainly the moving of Taylor Hall and a subsequent shifting dynamic in the dressing room), are things finally looking up for this Edmonton squad? The Oilers are finally moving into their new arena, Rogers Place, which is going to be a huge boost for the team and their fans. The move will bring a little added excitement, and potentially take away some of the sting from last season (we assume). The failures of the Oilers can be buried in Rexall Place (one would hope). In terms of personnel, the Oilers brought in Keith Gretzky to be their assistant General Manager, and parted ways with both Scott Howson and Tyler Dellow. The Oilers prized offseason free agent acquisition comes with a lot of misplaced expectation. He shouldn’t be viewed as a Taylor Hall “replacement” simply because he plays the same position and makes the same salary. Lucic can score but that isn’t his primary job, as was the case with Hall. The Oilers have been labelled as being “soft” and easy to play against, and Lucic’s presence goes a long way in changing that narrative. He’s got experience, and leadership, and he can still play at a high level. Just be realistic about what he’s here for, and you’ll love the guy. When the Columbus Blue Jackets decided to draft Pierre-Luc Dubois, the Oilers organization likely threw a mini-party. Jesse Puljujarvi was one of the most gifted players available and he literally fell into their laps. He is about as NHL ready as a rookie could get, but he’s not necessarily a lock to make the team out of camp. The Oilers would love for him to be on the opening day roster, but they won’t just give it to him if they don’t feel he deserves it. He would potentially slot onto the second or third line, dropping Kassian down to the fourth, and Pakarinen to the press box. Fair or not, Larsson will always be judged on the fact that he was acquired in exchange for Taylor Hall. The Oilers needed a right-handed, minute munching defenceman, and that’s exactly what they got in Larsson. He isn’t an offensive minded guy, and he won’t run the powerplay, but he fills a need on the team. He was very highly regarded in New Jersey and I suspect he’s going to become a fan favourite in due time. He didn’t decide to trade himself for Hall. He’s going to come in a do his job to the best of his ability. He should be judged on that, and that alone. For guy who has played just 107 NHL games, there seems to be a lot of expectation placed on Oscar Klefbom’s shoulders. It’s widely believed that his injury last season was the main reason why the Oilers defence corps faltered. 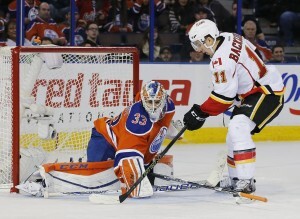 But now, he is fully healthy, and ready to be a big contributor on the Oilers blueline. Klefbom has the size, and the puck-moving ability to be a key factor in the team’s success. He only has seven career goals but those numbers could go up if he sees more time on the powerplay. He’s going to play a boatload of minutes alongside Larsson and those two could develop into a formidable number one pairing. Or least that’s what the Oilers are banking on. With a full NHL season as a starter finally under his belt, it’s Cam Talbot’s time to cement himself as a legitimate number one goalie. He had a decent season last year, but then again it’s difficult to judge based on the team playing in front of him. With the addition of Larsson and a healthy Klefbom, I’m assuming the defence will be improved. But Talbot is going to have to play well if the Oilers stand a chance, because the blueline is still fairly young and unproven. Jonas Gustavsson is an experienced NHL back-up and he’s going to provide the Oilers with a nice cushion if Talbot falters. Yakupov seems like an odd choice as candidate for breakout player, but hear me out. Last season, Yakupov asked for a trade out of Edmonton but none was consummated. 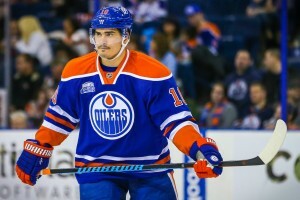 Whether or not they are still attempting to move him remains to be seen, but if Yakupov starts the season with the Oilers, it may very well be his last shot as a member of the Oilers. If he gets consistent linemates and playing time, we might finally see Yak come into his own. But he’s going to have to earn it, especially with the PTO signing of Kris Versteeg, which complicates things on right-wing. Yakupov’s struggles have been a combination of his poor development and handing, as well as his own confidence issues. This is a make or break season for Yakupov, and I hope that he finally proves why he was chosen first overall. This will be the fourth big league training camp that Darnell Nurse participates in. Will he be a permanent NHLer this season? 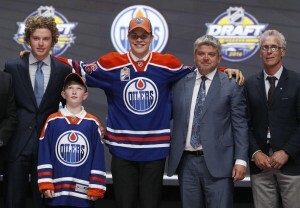 Defencemen notoriously take longer to develop and I like the way the Oilers have handled him. But his role still seems to be a question mark. Is he going to be an offensive-minded guy? Is he going to be one of those hard-hitting players that no one else wants to face? Will he be a mainstay in the top-4? Or a bottom pairing player? 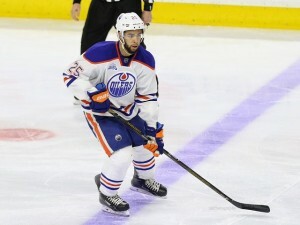 Nurse and the Oilers have to find out what kind of game fits to his strengths and how he can excel and help the team. After his infamous Roman Polak punch, he’s now known around the league. What does he want to be known for? We’re about to find out. I believe the Oilers will be better this year. How much better? A lot depends on health. Having McDavid and Nugent-Hopkins around for the whole season will be key. Klefbom is expected to be ready to start the season, but how much can be expected of him? He’s coming back from a tough injury, and we only saw a small sample size of his ability. Will Nurse be a fixture on the blueline? And how improved will that blueline actually be? Will Puljujarvi make the team and have a big impact? There are a lot of exciting players on this team, but many of them come with unknowns. That’s why it’s hard to predict a playoff appearance. I don’t think they’ll finish last in the division, but I would caution any predictions of a massive jump in the standings.